Jason Gregor: Forward Anton Slepyshev has had his name come up in trade talk, but since he’s waiver exempt still, why not reassign him to the AHL and let him play a lot to see what he does. The Fourth Period: CapFriendly is showing the Montreal Canadiens have about $9.68 million in cap space. One NHL executive said that Canadiens GM Marc Bergevin has ‘been working the phones this season’ looking to upgrade his team. The Canadiens would like to add some more scoring up front and a mobile defenseman. It is believed that they are looking at rental options. Wayne Simmonds hasn’t been made available by the Philadelphia Flyers just yet, but if they don’t turn their season around he might be, and the Canadiens could be interested. Simmonds does have a 12-team no-trade list and a $3.975 million cap hit for one more year. The cost to acquire would be high, possibly too high for the Canadiens. The Canadiens could talk to the Buffalo Sabres, who may be willing to listen on anyone not named Jack Eichel. The Colorado Avalanche could have a list of players they’d be willing to take calls on. 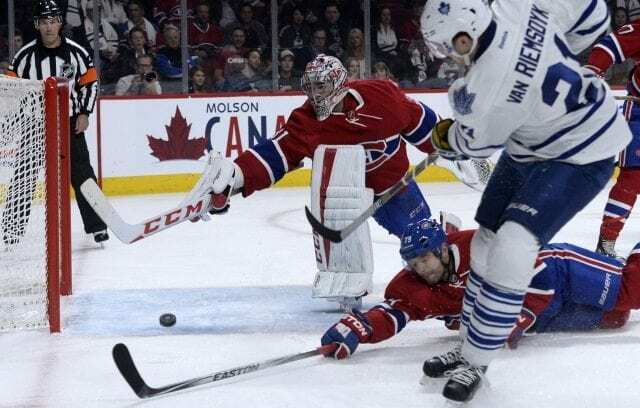 Maple Leafs Hot Stove: Bob McKenzie was on TSN 1050 talking about the Toronto Maple Leafs and if they would consider trading any of their pending unrestricted free agents. “I think they’re always open-minded to what might be out there, but the better the team does, the less likely — in my mind – they’re going to trade one of their pending UFAs in Bozak, van Riemsdyk or Komarov. that they’ll keep them and be the best team they possibly can be and go as far and as deep into the playoffs as they can with this group.